"They helped me after... ", Why has medicine become so reactive and not proactive? I saw an ad: “After my stroke, Hospital X restored my strength.” The call to action is to quickly seek treatment at Hospital X after the stroke strikes. Stress management is an important component to a healthier lifestyle without the chronic diseases that have skyrocketed in our society. Just like the prevention plans for each of our patients, the best method for stress management is going to depend on the person. One of the tools to reduce stress and improve health is meditation. Over the weekend Dr Backs and Coach Mike had the opportunity to talk with a group at CrossFit Edwardsville about the Longevity program developed at CrossFit Instinct. The invite came from owners Greg and Caroline Skelly along with Coach Mark Donavon because they are going to be launching their own Longevity program for the Glen Carbon and Edwardsville area. What do a small car, a full grown polar bear, and our patients have in common? A ton. No, an actual ton of weight. As a dentist, our friend Dr. Peter Glatz is expected to spend a lot of time thinking about peoples' mouths. Dr. Glatz is not just worried about keeping your mouth healthy but also the food that you put into your mouth. Is there any question that optimal prevention, if effective and measurable, would be a better strategy to save lives, prevent disability, and dramatically lower costs? Few recommendations evoke strong opinions like the subject of statin therapy. It is unfortunate that there is so much misinformation about statins guiding ill informed choices. I hope this brief overview adds more light than heat to the discussion. Your oral health has a bigger impact on your overall health than you may suspect. Inflammation and disease in the mouth can have negative impact throughout your whole body and lead to some very serious conditions. The U.S Department of Agriculture is accepting public comments for the 2020-2025 U.S. Dietary Guidelines for Americans. They are accepting comments through March 30, 2018 so there is still time to send in your comments. Disclaimer: This paper was written to share information with friends and colleagues about the harmful and addictive nature of sugar, which I learned more about through the Crossfit Instinct Longevity class in Springfield, IL. Books and web sites used as sources are listed at the end. Some, but not all, are cited in the text. The paper was initially prepared for a verbal presentation to a small group of women and not intended for publication. Sugar has changed the world, and the history of sugar is not all sweet. Its origins date back 10,000 years to New Guinea, which is located north of Australia, where sugar cane was first domesticated. Sugar cane reached the Asian mainland by 1000 BC. Indian alchemists discovered how to make a white powdered version of sugar by 500 BC. Sugar spread to the Middle East and then Europe, but it was initially only available to the wealthy. How does visceral fat lead to heart disease? Type 2 Diabetes increases the risk of having arterial disease and heart attack. You have probably seen ads for diabetes medication making that known. The implication is that their medication lowers the risk of dying of heart attack. But there is a deeper truth. Before blood glucose rises, atherosclerosis is developing, and many have heart attacks before having high glucose. The suspected mechanism is high insulin levels that compensate for insulin resistance. Excessive visceral fat causes insulin resistance. Insulin resistance inflames arteries leading to atherosclerosis. If we rely on rising glucose or Hemoglobin A1c to diagnose insulin resistance, it will be identified later rather than sooner. Once a baseline visceral fat level is measured, a plan to reduce fat is offered. That plan is generally straightforward: eliminate sugar, especially processed food. Serial measurement shows progress away from becoming diabetic and atherosclerosis toward greater health and resilience. Of all the opportunities to reduce heart attack death and disability, reducing visceral fat is among the greatest. Get yours measured. Having high visceral fat is serious, but it isn’t as serious as a heart attack. Women and men are different, including in the way we present with heart attacks. Most of the classic symptoms of crushing chest discomfort, sweating, and shortness of breath with arm aching (which normally provoke an urgent response when present) may be completely absent in the woman having a heart attack. Women are more likely to go undiagnosed and die with their heart attack because it goes unrecognized. That is why I believe it is even more important for asymptomatic women than men to be screened for arterial disease with carotid ultrasound looking for plaque. These symptoms in a woman with known disease will be taken more seriously, while reassurance will be easier and more appropriate if screening reveals no disease. I have commonly had couples present to my office to have the male screened for arterial disease. When we turn to the woman and convince them early detection and prevention are important for both, we often find more severe disease in the woman. It costs so little and is painless to be screened with carotid ultrasound with intima media thickness and plaque character focus. It will detect disease far earlier than stress tests or even angiograms at a fraction of the cost and risk. Why do people resist testing for arterial disease? · Most of us are more reactive than proactive by nature. Steve Covey’s First of 7 Habits is “Be Proactive.” That suggests to me that this is a problem for many of us. · Denial. This is the first reaction most people have to bad news. “I don’t want to know.” Women now routinely get their annual mammogram. It is expected. It took years to create this expectation. The same needs to happen with early detection and management of arterial disease. It will save more lives than mammograms. · Defensiveness. When we are told “there might be a better way” we tend to hear “you aren’t doing the ‘right’ thing.” Ego can keep us from learning about and implementing new approaches, even if they are more effective and cost less. Those who provide the status quo feel threatened by change, especially if it threatens their livelihood or makes their current investment obsolete. · Fear of the consequences. This is a legitimate concern. “I had a positive coronary calcium score. I was feeling fine. That led to a stress test, then a cath and the next think I know I had bypass surgery!” This is the story we want to avoid. Identify the disease you have, but manage it to reverse it. Avoid the trauma of intervention, disability or death. Choose prevention. · Faith in Rescue. “If I have a heart attack or stroke, technology is so good I will be saved.” Like skydiving, we think the parachute will save us. But what if it doesn’t open because we let someone else pack our chute? We all must take responsibility for our own health. Don’t count on a rescue. You may not live long enough to get to the hospital and it may not work. If it works, it will be a great story, but it will change your life and cost outrageous sums of money that will be somebody’s burden. · Inadequate information. Many don’t know that arterial disease can improve. It can improve with personalized understanding of its root causes, effective lifestyle and medical treatment and measurements that show results. Don’t let these or any other reasons prevent you from knowing all you can know to be healthier. The Center for Prevention can help you, but first you have to Choose Prevention. For those patients who show onset of atherosclerosis, we move on to step 2, where we attempt to determine the causes of arterial disease. We recognize that atherosclerosis can have many root causes, and by identifying the actual issues that might cause disease for each individual (rather than take a one size fits all approach), we are able to better treat the patient and prevent the onset of further disease. In this step, we perform several advanced lab tests, all based on blood draws, including reviewing the lipid panel, Apolipoprotein B, Lipoprotein(a), HbA1c (to detect diabetes and prediabetes), LpPLA2 ( to detect inflammation) and Vitamin D levels. From these tests, we offer a consultation and make specific and individual recommendations. We only administer follow up tests to those employees who have been identified as having a higher risk for heart attack or stroke. Our goal is to save your human capital and preserve a healthy bottom line. Skip Your Next Heart Attack! The month of February is national heart disease awareness month. At The Center for Prevention: Heart Attack and Stroke, we want you to know that you don't have to have a heart attack, or a stroke for that matter. No matter how high your risk, we implement the effective, evidence based strategies that go beyond the standard of care based on the Bale-Doneen method, outlined in the book Beat the Heart Attack Gene. Beat The Heart Attack Gene, by Bradley Bale, MD and Amy Doneen, ARNP, allows a new understanding of prevention of heart disease. It gives readers materials to show their doctors and ensure personalized and unique care based on their needs and risk factors. The authors provide insight as to how their method could prevent a recurrence of heart attack or stroke by identification of what could be triggering the disease. We encourage you to check out that book, as well as our website and come see us to have an assessment. Learn if you have arteriole disease, and then learn how to best avoid the consequences. You don't have to have a heart attack, you can skip it! 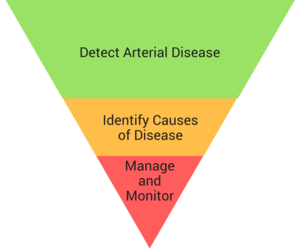 Our first step is to detect arterial disease, also known as atherosclerosis. We use the Carotid IMT, a quick non-invasive test which can be performed in our office or in yours. The CIMT detects thickening of the arterial wall, a sign of atherosclerosis, which can typically be seen through imaging well before symptoms present themselves. For a low fixed cost, companies can have us screen their employees to prevent issues before they arise! Companies who take advantage of the Healthy Business Prevention Program benefit from improved productivity and cost-savings for health insurance plans. At the Center for Prevention Heart Attack and Stroke in Springfield, Illinois, we believe that education is very important. If we have the wrong information and keep acting upon it we are doomed to repeat the mistakes of the past. In late 2013, Dr. Backs learned of the Bale-Doneen Method and attended his first preceptorship in November 2013. He had to unlearn much of what he thought I knew about treating arterial disease and incorporate new information into the treatment of my patients. The results have been very good. It’s important that we all be educated on what really causes arterial disease. This is well outlined in Drs. Bale and Doneen’s book called, “Beat the Heart Attack Gene.” Published in February 2014, it is intended for the general public, and we urge you to get a copy and read it. All the patients in the Heart Attack and Stroke Prevention program get a copy of this book so they understand their opportunities and can speak the same language. So educate yourself about the truth about prevention of heart attack and stroke and arterial disease. At the Center for Prevention, we believe that preventing heart attacks and stroke BEFORE tragedy strikes is not only possible, but a preferable way to address cardiovascular disease. The Bale-Doneen Method follows a 6 step process in assessing and treating patients to prevent heart attack and stroke. The first step is Education, which is what this message will review in slightly more detail.